"How are you travelling around the state?" Good to know he has his own car, albeit he lives with his parents, is unemployed, facing a felony and otherwise. Uh-yah. He's a mystery man, alright - he doesn't seem to talk. Anyone have any theories on this guy? Let's be brutally honest, it only takes a few seconds to tell Mr. Greene is not "the sharpest tool in the shed." Someone recruited him (with or without knowledge of upcoming charges I couldn't say, but I'd flip a coin), paid his filing fees and perhaps some petty cash for advertising, food, clean underwear, gas for the sporting 2003 automobile he drives and other assorted expenses. I am guessing he also received some political guidance in the form of talking points sheets, and/or a couple loose scripts - at minimum. Did I mention he is black? It gets even better from Lipton's perspective - Read the rest. The campaign of defeated Democratic Senate candidate Vic Rawl has assembled a team of national academic experts to review Tuesday’s perplexing South Carolina primary results that propelled a virtually unknown, underfunded and unemployed candidate to the party’s nomination over a veteran officeholder and public official. Rawl campaign manager Walter Ludwig tells POLITICO three different teams of experts in election data analysis are combing through the results in the state’s 46 counties and already turning up some eye-opening trend lines. The review is in response to the shocking victory by 32-year-old Alvin Greene, who, despite never giving a campaign speech or running any television or radio ads, managed to handily defeat Rawl 59 percent to 41 percent. The state party chairwoman has already asked Greene to step aside, and Rep. Jim Clyburn (D-S.C.) has speculated that he might be a Republican plant. Maybe this is just a case of the DNC losing control of the votes on the ground? Political parties are, in small increments, losing control of their former power. In California the Open Primary has just been established, it makes sense that disgust with what the central political establishment picks has also spread to South Carolina. Definitely a mystery. We only have two important political parties in this country. Neither should be THIS incompetent. Sounds like he's just as Qualified as Obama. I'm going to have to go give Carol a piece of my mind! 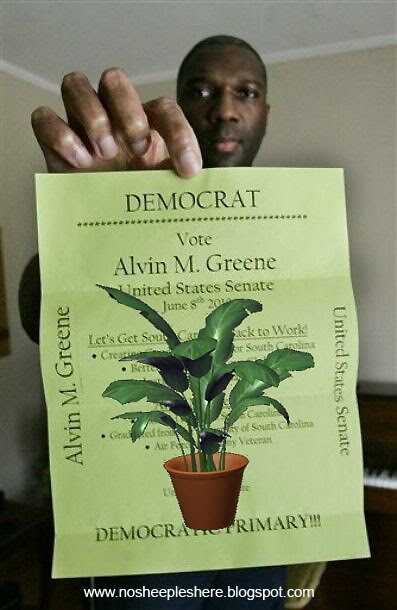 Comparing Greene to a potted plant may be an insult to potted plants! But in reality, the Republican party doesn't need a plant to make the Democrats look like a bad choice. They are doing a great job as a whole! I'm going with his name was first on the ballot. I don't think anyone knew his race.